← Happy 50th! And Happy Mother’s Day! Last weekend was the best! The QCS Ranch hosted the annual fall Kevin Vesey Equine Clinic. Twenty-five riders ranging from six to sixty years old, along with their four-legged BFFs, walked, trotted and loped through the weekend. 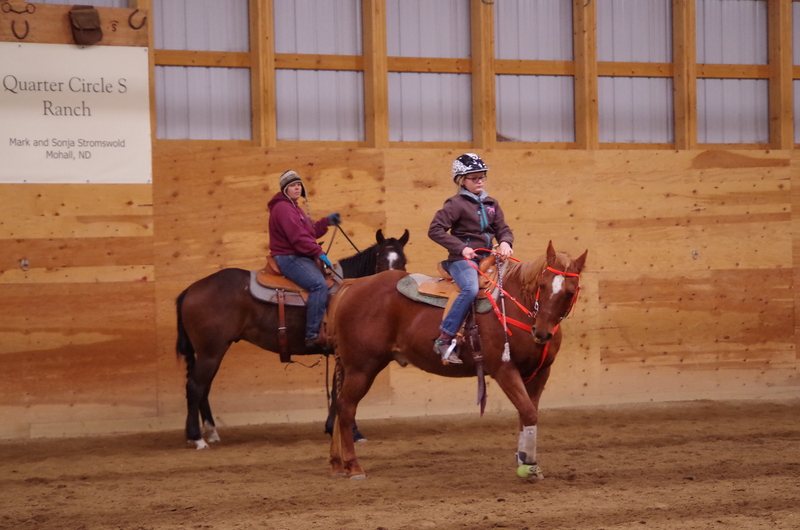 We learned basic skills for getting our horses to pay attention to us. We pretended we were turning cows, barrels and doing spins. We worked on issues we have with our horses (or maybe issues they have with us!). We were reminded how to look through a child’s eyes. Sometimes we sat still and listened. There was plenty of pondering. Learning is so much work! But it really wasn’t about learning new horse skills. Or fixing problems. It was about spending time with old friends and making new ones. Being with people and critters with whom we share common interests. It was about breaking bread together, laughing together and resting together. For me, it was a wonderful break in the midst of a whirlwind of fall’s work and baking season. For me, it was the best weekend ever! Image | This entry was posted in Everyday Circus, QCS Ranch and tagged barrels, horse clinics, horses, kevin vesey equine center, North Dakota life, QCS Ranch, reining, working cow. Bookmark the permalink. 3 Responses to Four-legged Fun! Good to hear from you!! I’ve been wondering about ya! I did!! Its good to see your smiling face back in my comment list!! Can’t wait for your next post.